At the Server step of the wizard, select a Microsoft Windows server that you plan to use as a WAN accelerator and define port and connection settings for this server. From the Choose server list, select a Microsoft Windows server added to the backup infrastructure. If the server is not added to the backup infrastructure yet, you can click Add New to open the New Windows Server wizard. For more information, see Adding Microsoft Windows Servers. 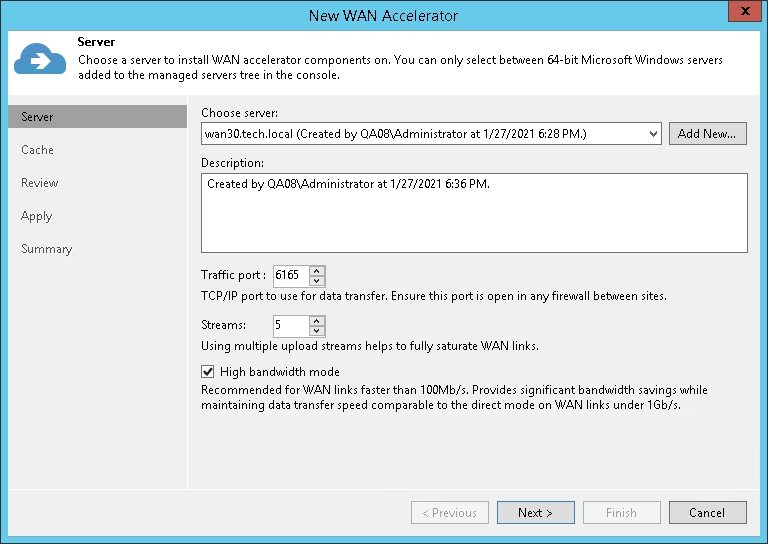 It is recommended that you describe the added WAN accelerator as the source or target one. When you create a remote job, this hint will be displayed in brackets next to the WAN accelerator name, which will help you choose the necessary WAN accelerator to be used on the source or target side. In the Traffic port field, specify the number of the port over which WAN accelerators must communicate with each other. By default, port 6165 is used. In the Streams field, specify the number of connections that must be used to transmit data between WAN accelerators. By default, 5 connections are used. This setting applies only to the source WAN accelerator. The greater is the number of streams, the more bandwidth resources Veeam Backup & Replication will use. A great number of streams engage more CPU and memory resources of the source WAN accelerator.